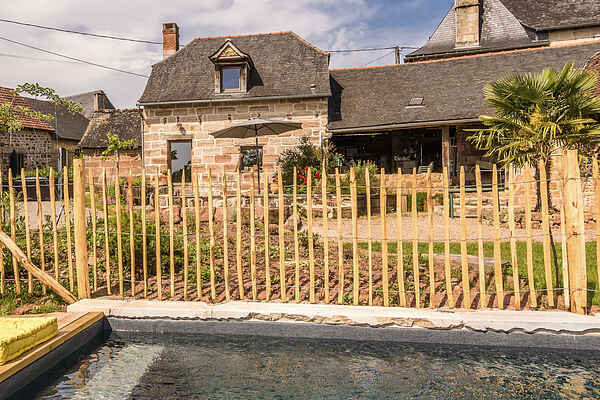 La Porcherie is part of a farming hamlet with a view of the green countryside of Acquitaine. The cottage has been very tastefully renovated and offers plenty of room for a couple with a child. The hilly green surroundings are great for hiking and offer good little restaurants, flea markets, farmers' markets etc. 7 km from Objat, where you can visit a large cosy market every Sunday morning There is also a recreation opportunity In Objat, with pedal boats, swimming pool with slide, canoeing etc. 20 km from Pompadour (horses competition). A day shopping in Brive (23 km) and Perigeux (70 km). Limoges (80 km) is known for its porcelain factories, which you can visit.